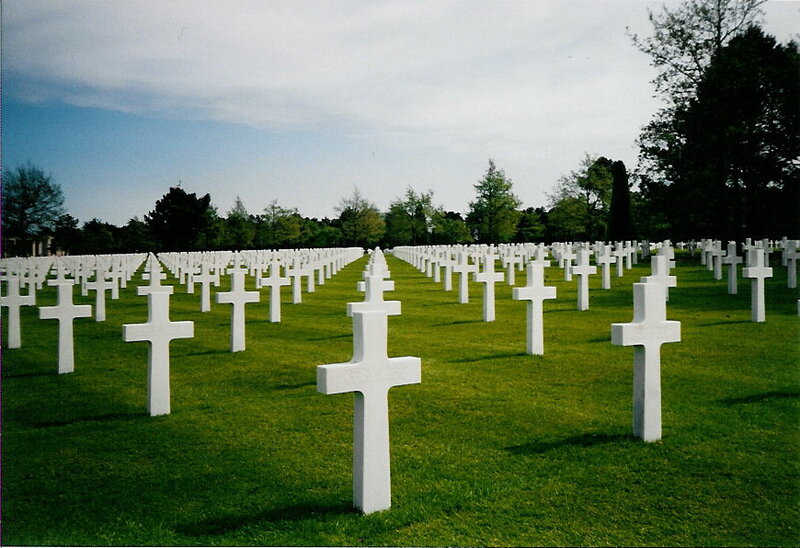 July 1, 2012: Thanks for protecting! On the way out of the Del Mar Fair, I saw this dusty Sheriff’s vehicle parked in front of the entrance. Law enforcement was patrolling the parking lot and the Fair. 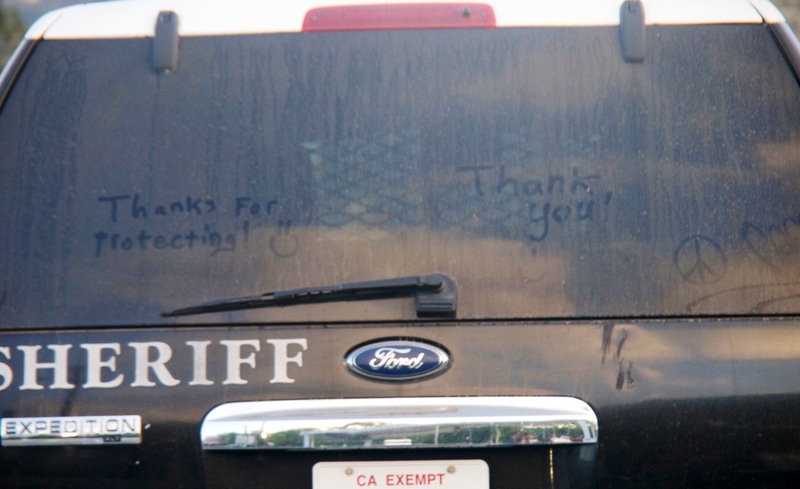 Looks like some fair-goers took advantage of the dust to thank them for their service. It occurs to me that the dust message may be older than Saturday and that the driver was proud enough of it to leave off washing his Ford Expedition for an extra day or two. Look closely at the trees in the background. There are a lot of picnic tables under them, unattended, with picnic supplies. Photo from Timber-Rider at CoasterBuzz. My girlfriend and I went to the Del Mar fair yesterday. It was fun, but the only ride I really enjoyed was the Tilt-a-Whirl and Alien Abduction. I have never enjoyed the “high-thrill” rides at amusement parks. When I was younger we used to go to a place called Deer Park. I avoided the roller-coasters and pretty much spent all day on a ride called The Spider. The Spider was slightly higher-thrill than the Tilt-a-Whirl, which I considered a wimpy ride at the time. Thinking of The Spider reminded me of how we used to picnic at Deer Park back in the seventies. If you know it by its current name of Michigan Adventure, you probably don’t know about the picnic tables under the trees. Deer Park used to look a lot like a forest. We would arrive in the morning, grab a picnic table, leave our stuff at the picnic table, and then go on rides until lunchtime. Then leave our stuff at the picnic table to go on rides until we left. The Spider doesn’t appear to be a popular ride any more. The closest I could find is The Octopus. 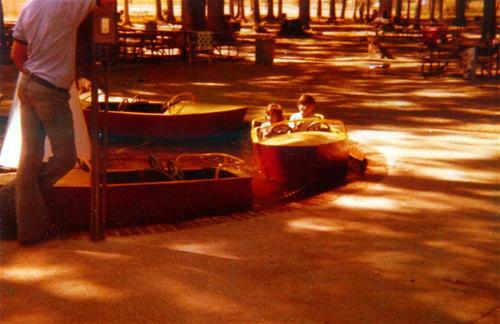 But I did find some seventies photos of Deer Park from CoasterBuzz poster Timber-Rider. Besides The Spider there is a photo of one of the kiddie rides next to the picnic area. You can just barely see the unattended picnic tables loaded down with treats for Yogi Bear or his less couth human cousins. Probably not something you could do nowadays even if it still had a picnic area. Somebody’s got too much time on their hands and not enough logic in their press releases at the Michigan Department of Environmental Quality. We’ve been hoping to get a thunderstorm while traveling, so we’ve been paying attention to the weather forecasts in areas we’ll be traveling in.1 This morning there was an air quality advisory in some of the counties in Michigan we’ll be visiting. Besides being in all-caps, which I guess is understandable2 I don’t think they’re taking their own alert very seriously. Pollutants are expected to be in the unhealthy for sensitive groups range… people and businesses are urged to… [engage in positive activities such as] biking to work. It is recommended that active children and adults—and persons with respiratory diseases such as asthma—limit prolonged outdoor exertion. The counties listed in the advisory are mostly very rural areas. Any biking to work is going to be “prolonged outdoor exertion”. 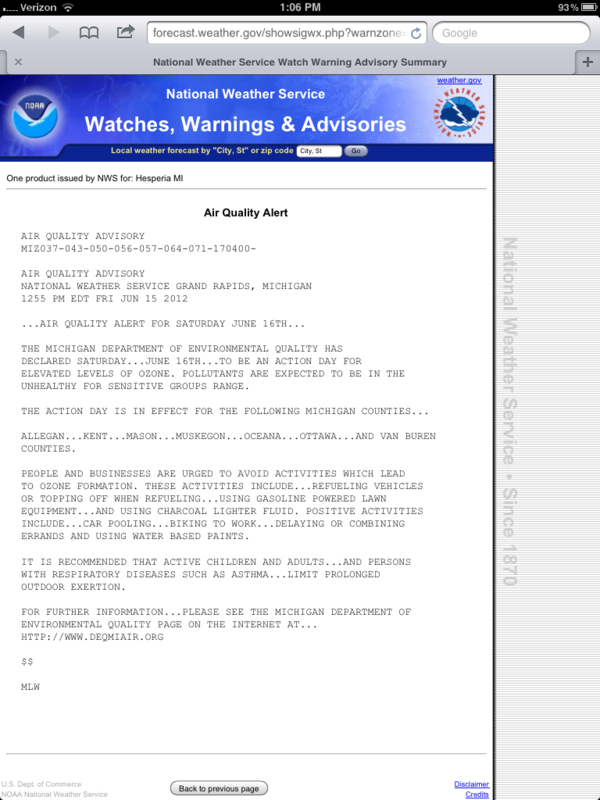 And what does it mean that active children and adults limit their prolonged outdoor exertion, and also inactive persons with respiratory diseases limit their prolonged outdoor exertion, but any other inactive persons with other diseases, go ahead, exert yourselves on this day of expected poor air quality? I get the feeling that whoever put this alert together doesn’t take it seriously. I’d even be willing to bet that they either did or did not bike to work. Ya didn’t get me, feds. Have a nice day. 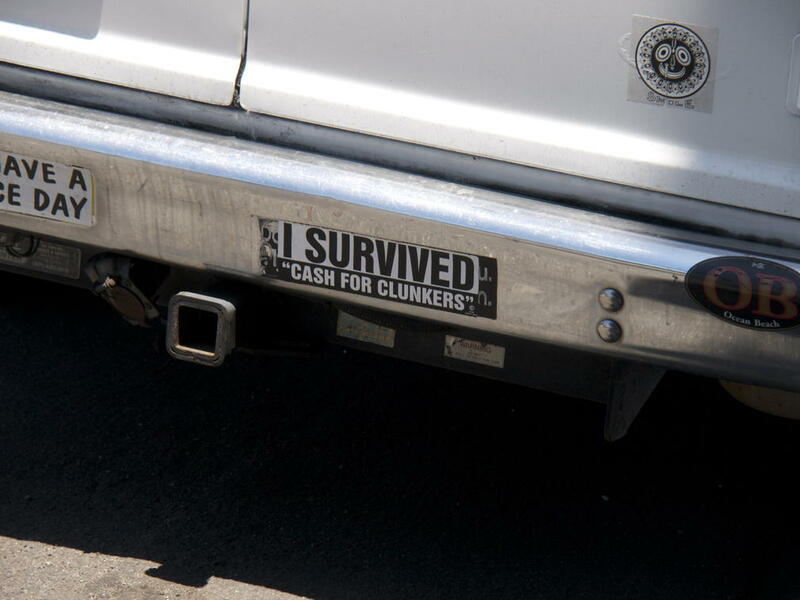 I saw this while out walking over Memorial Day weekend and got a good laugh out of it. 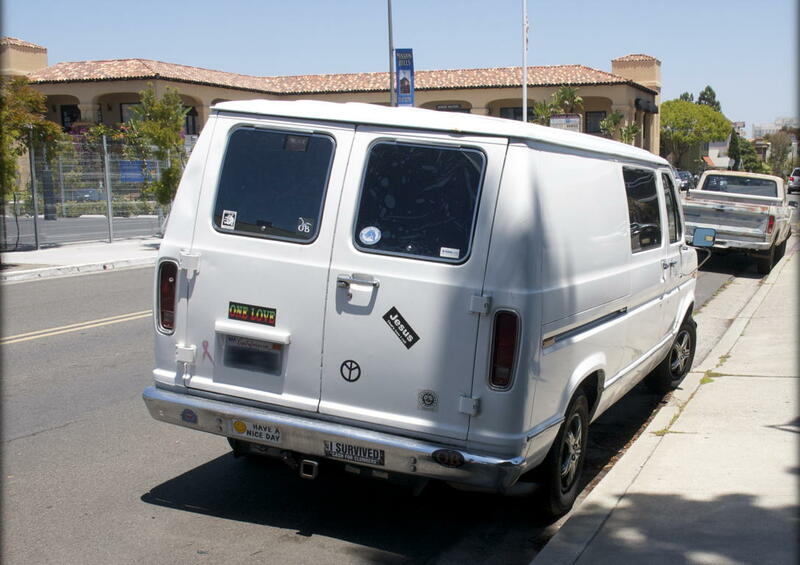 This van doesn’t look to be in bad shape—in fact, it looks great—but it still likely qualified as a clunker to the government based on its gas mileage (18 mpg or less) assuming it was new enough: for it to be a clunker it would have needed to be less than 25 years old, so it’s possible this van survived by virtue of being too old to be a clunker. It looks to my very untrained eye to be a Ford Econoline (I see what looks like the Ford oval painted over on the back), and this shape could be anywhere from 1975 to 1991. Frankly, an Econoline under 25 years old is practically new. Those things last forever. My third car was a van very much like this. It was a Plymouth Voyager from 1974. Same classic boxy van. Mine showed its rust more, and the driver-side door had fallen off, so I replaced it with the driver-side door from the equivalent ’74 Dodge, found in a junkyard. No key for it—I had to enter the van from the passenger-side double doors. Only paid $250 for the van, don’t remember how much the door cost. I knew exactly what I was buying when I got it: a vehicle that would get me wherever I wanted to move. Drove it to Ithaca and back from Michigan a couple of times, and then drove it out to California. Its last trip brought me from Los Angeles to San Diego, but by then the transmission had lost reverse. So I sold it for $200 to someone who didn’t need reverse. Between the Voyager and my first car, a 1964 Buick LeSabre, it’s a wonder I could afford gas to go anywhere, but I don’t remember it ever being a problem even when I had no money to speak of. Gas had only just recently crossed the dollar threshold when I was in college (some gas pumps still used double-digit readouts, with a “1” painted in front of the two numbers), and it then hovered around $1.20-$1.40 or so, I think through most of the eighties before dropping back again when I came out to California. The markings on this artifact show it to be from Ocean Beach, San Diego’s home of the hippy. I mainly went because I keep hearing his name come up on sites like Watts Up With That? He is definitely an engaging speaker, so I recommend seeing him if you get the chance. A lot of it was about California’s AB32 and how much money it is going to cost us for how little benefit—even assuming the most drastic predictions, despite such predictions uniformly failing in the past. 2012 in photos last modified July 1st, 2012.